Blink and you’ll miss it. A modest sign outside a metal gate on the cliff top just before the Chapman’s Peak toll plaza is the only clue to the existence of one of the Western Cape’s most dazzling holiday venues. From the car park, a shuttle takes you down a steep, winding road. As the noise of the traffic fades and the hum of the cicadas takes over as the sea breeze rises to meet your face, you begin to readjust to a new rhythm. By the time you reach the hotel, you have already begun to adjust to the timeless, magical realm of Tintswalo Atlantic. As luxury hotels go, it’s not dripping with opulence or ostentation – it’s something completely different. 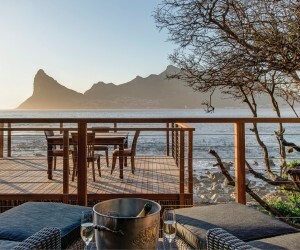 Sitting on the deck, taking in the view – and what a view: the eye ranges from the waves lapping the pebbled beach, across the sparkling, ever-changing waters to Hout Bay harbour, sweeps across the craggy shapes of the encircling mountains and plunges into the endless vista of the open Atlantic ocean beyond – you soon realise that Tintswalo Atlantic has achieved a classical balance. Every element of the built environment harmonises with the natural surroundings. It’s like having coffee inside a symphony, or a poem. Despite being in Cape Town, you feel light-years away from any urban crush. No wonder it’s one of the Cape’s most sought-after venues, currently booked up three months in advance. It’s hard to believe that just two years ago, this scene of unparalleled tranquility had been transformed into an inferno. Fanned by strong winds and fueled by extreme temperatures, fires swept down across the mountain from Chapman’s Peak and burnt the entire hotel to ashes. Paradoxically, that very destruction has brought about a transformation that has seen Tintswalo Atlantic soar to new heights. General manager Ryno du Rand recalls the occasion: “Everything burnt down in an hour and a half. Being located on San Parks property, the hotel was constructed to fit in with the environment. All the structures were made of wood, so it lit up like a torch. So it was that the fire turned out to have a silver lining. “When we started the original lodge, we always had an idea of what we wanted it to become, but as time passed, it turned out different to what we had anticipated. The spaces that burnt down gave us to the opportunity to fix what was wrong. It’s not often that you get a second chance like that. Now we could recreate the lodge exactly according to what the clients want.” Ironically, Tintswalo Atlantic owes its existence in the first instance to fire: the property was previously occupied by a camp site that burnt down. The hotel was originally intended to be built at the Round House in Camps Bay, but when the Goosens chanced upon the place during a walk on Chapman’s Peak, they changed their minds and entered into a 25-year concession agreement with Sanparks. “We have the option to renew, if not, the buildings can be removed without leaving any footprint. The original lodge was built in a forest of huge, protected milkwood trees: we had to build underneath and around them, which was quite a tricky process. As the only hotel to be situated in the Table Mountain National Park, Tintswalo Atlantic is completely integrated with nature, but it is also thoroughly connected to the local community.“When we were rebuilding the lodge,” Ryno illustrates, “we identified various community projects in Hout Bay that we supported. In particular, the National Sea Rescue Institute helped us a lot during the fire, so in exchange we repainted their building on the inside. Every year, to commemorate the year we burnt down, we do a fund-raiser, selling tickets for tables and donating all the proceeds to fire-related charities. At the last one, we managed to raise enough money for the NSRI to buy a new boat.” As part of its ongoing commitment to raising fire awareness, Tintswalo is also supporting the Thula Thula project in Hout Bay. Working with the fire department, they are actively training youth on how to prevent fires. This helps raise awareness about fire in the township, where fires are commonplace. In this way, Tintswalo is helping to preserve the uniqueness of the Hout Bay area for years to come.